1 A None No Power Seat 1 A is a Business Premiere Bulkhead seat where the close proximity to the lavatory and galley may be bothersome as this seat faces outwards into the aisle. Passengers traveling with infants are often seated here as there are bassinets located in this row. 1 J None No Power Seat 1 J is a Business Premiere Bulkhead seat where the close proximity to the lavatory and galley may be bothersome as this seat faces outwards into the aisle. Passengers traveling with infants are often seated here as there are bassinets located in this row. 1 K None No Power Seat 1 K is a Business Premiere Bulkhead seat where the close proximity to the lavatory and galley may be bothersome as this seat faces outwards into the aisle. Passengers traveling with infants are often seated here as there are bassinets located in this row. 2 A None No Power Seat 2 A is a standard Business Premiere seat. 2 J None No Power Seat 2 J is a standard Business Premiere seat. 2 K None No Power Seat 2 K is a standard Business Premiere seat. 23 A None No Power Seat 23 A is a standard Premium Economy Bulkhead seat. Passengers traveling with infants are often seated here as there are bassinets located in this row. 23 B None No Power Seat 23 B is a standard Premium Economy Bulkhead seat. Passengers traveling with infants are often seated here as there are bassinets located in this row. 23 D None No Power Seat 23 D is a standard Premium Economy Bulkhead seat. Passengers traveling with infants are often seated here as there are bassinets located in this row. 23 E None No Power Seat 23 E is a standard Premium Economy Bulkhead seat. Passengers traveling with infants are often seated here as there are bassinets located in this row. 23 F None No Power Seat 23 F is a standard Premium Economy Bulkhead seat. Passengers traveling with infants are often seated here as there are bassinets located in this row. 23 J None No Power Seat 23 J is a standard Premium Economy Bulkhead seat. Passengers traveling with infants are often seated here as there are bassinets located in this row. 23 K None No Power Seat 23 K is a standard Premium Economy Bulkhead seat. Passengers traveling with infants are often seated here as there are bassinets located in this row. 24 J None No Power Seat 24 J is a standard Premium Economy Class seat. 25 J None No Power Seat 25 J is a standard Premium Economy Class seat. 3 A None No Power Seat 3 A is a standard Business Premiere seat. 3 J None No Power Seat 3 J is a standard Business Premiere seat. 3 K None No Power Seat 3 K is a standard Business Premiere seat. 34 J None No Power Seat 34 J is an Economy Class Bulkhead seat where the close proximity to the galleys and lavatory may be bothersome. The tray table and TV are in the armrest, making the armrest immovable and slightly reducing seat width. There is no floor storage during take-off and landing. Passengers traveling with infants are often seated here as there are bassinets located in this row. 34 K None No Power Seat 34 K is an Economy Class Bulkhead seat where the close proximity to the galleys and lavatory may be bothersome. The tray table and TV are in the armrest, making the armrest immovable and slightly reducing seat width. There is no floor storage during take-off and landing. Passengers traveling with infants are often seated here as there are bassinets located in this row. 35 A None No Power Seat 35 A is an Economy Class Bulkhead seat that may have some extra legroom, but the close proximity to the galleys and lavatory may be bothersome. The tray table and TV are in the armrest, making the armrest immovable and slightly reducing seat width. There is no floor storage during take-off and landing. Passengers traveling with infants are often seated here as there are bassinets located in this row. 35 B None No Power Seat 35 B is an Economy Class Bulkhead seat that may have some extra legroom, but the close proximity to the galleys and lavatory may be bothersome. The tray table and TV are in the armrest, making the armrest immovable and slightly reducing seat width. There is no floor storage during take-off and landing. Passengers traveling with infants are often seated here as there are bassinets located in this row. 35 C None No Power Seat 35 C is an Economy Class Bulkhead seat that may have some extra legroom, but the close proximity to the galleys and lavatory may be bothersome. The tray table and TV are in the armrest, making the armrest immovable and slightly reducing seat width. There is no floor storage during take-off and landing. Passengers traveling with infants are often seated here as there are bassinets located in this row. 35 D None No Power Seat 35 D is an Economy Class Bulkhead seat where the close proximity to the galleys and lavatory may be bothersome. The tray table and TV are in the armrest, making the armrest immovable and slightly reducing seat width. There is no floor storage during take-off and landing. Passengers traveling with infants are often seated here as there are bassinets located in this row. 35 E None No Power Seat 35 E is an Economy Class Bulkhead seat where the close proximity to the galleys and lavatory may be bothersome. The tray table and TV are in the armrest, making the armrest immovable and slightly reducing seat width. There is no floor storage during take-off and landing. Passengers traveling with infants are often seated here as there are bassinets located in this row. 35 F None No Power Seat 35 F is an Economy Class Bulkhead seat where the close proximity to the galleys and lavatory may be bothersome. The tray table and TV are in the armrest, making the armrest immovable and slightly reducing seat width. There is no floor storage during take-off and landing. Passengers traveling with infants are often seated here as there are bassinets located in this row. 35 H None No Power Seat 35 H is an Economy Class seat that may have some extra legroom as there is no seat in front, however people may tend to bump into this seat as well. 4 A None No Power Seat 4 A is a standard Business Premiere seat. 4 J None No Power Seat 4 J is a standard Business Premiere seat. 4 K None No Power Seat 4 K is a standard Business Premiere seat. 49 A None No Power Seat 49 A is an Economy Class seat that may have limited recline. The close proximity to the lavatories behind may be bothersome. 49 B None No Power Seat 49 B is an Economy Class seat that may have limited recline. The close proximity to the lavatories behind may be bothersome. 49 C None No Power Seat 49 C is an Economy Class seat that may have limited recline. The close proximity to the lavatories behind may be bothersome. 49 D None No Power Seat 49 D is an Economy Class seat that may have limited recline. The close proximity to the lavatories behind may be bothersome. 49 E None No Power Seat 49 E is an Economy Class seat that may have limited recline. The close proximity to the lavatories behind may be bothersome. 49 F None No Power Seat 49 F is an Economy Class seat that may have limited recline. The close proximity to the lavatories behind may be bothersome. 49 H None No Power Seat 49 H is an Economy Class seat that may have limited recline. The close proximity to the lavatories behind may be bothersome. 49 J None No Power Seat 49 J is an Economy Class seat that may have limited recline. The close proximity to the lavatories behind may be bothersome. 49 K None No Power Seat 49 K is an Economy Class seat that may have limited recline. The close proximity to the lavatories behind may be bothersome. 5 A None No Power Seat 5 A is a standard Business Premiere seat. 5 J None No Power Seat 5 J is a standard Business Premiere seat. 5 K None No Power Seat 5 K is a standard Business Premiere seat. 50 A None No Power Seat 50 A is an Economy Class Exit Row seat that may have extra legroom, however the close proximity to the lavatories and galley may be bothersome. The tray table and TV are in the armrest, making the armrest immovable and slightly reducing seat width. There is no floor storage during take-off and landing. 50 B None No Power Seat 50 B is an Economy Class Exit Row seat that may have extra legroom, however the close proximity to the lavatories and galley may be bothersome. The tray table and TV are in the armrest, making the armrest immovable and slightly reducing seat width. There is no floor storage during take-off and landing. 50 C None No Power Seat 50 C is an Economy Class Exit Row seat that may have extra legroom, however the close proximity to the lavatories and galley may be bothersome. The tray table and TV are in the armrest, making the armrest immovable and slightly reducing seat width. There is no floor storage during take-off and landing. 50 H None No Power Seat 50 H is an Economy Class Exit Row seat that may have extra legroom, however the close proximity to the lavatories and galley may be bothersome. The tray table and TV are in the armrest, making the armrest immovable and slightly reducing seat width. There is no floor storage during take-off and landing. 50 J None No Power Seat 50 J is an Economy Class Exit Row seat that may have extra legroom, however the close proximity to the lavatories and galley may be bothersome. The tray table and TV are in the armrest, making the armrest immovable and slightly reducing seat width. There is no floor storage during take-off and landing. 50 K None No Power Seat 50 K is an Economy Class Exit Row seat that may have extra legroom, however the close proximity to the lavatories and galley may be bothersome. The tray table and TV are in the armrest, making the armrest immovable and slightly reducing seat width. There is no floor storage during take-off and landing. 52 D None No Power Seat 52 D is an Economy Class Bulkhead seat where the close proximity to the galley may be bothersome. The tray table and TV are in the armrest, making the armrest immovable and slightly reducing seat width. There is no floor storage during take-off and landing. 52 E None No Power Seat 52 E is an Economy Class Bulkhead seat where the close proximity to the galley may be bothersome. The tray table and TV are in the armrest, making the armrest immovable and slightly reducing seat width. There is no floor storage during take-off and landing. 52 F None No Power Seat 52 F is an Economy Class Bulkhead seat where the close proximity to the galley may be bothersome. The tray table and TV are in the armrest, making the armrest immovable and slightly reducing seat width. There is no floor storage during take-off and landing. 6 A None No Power Seat 6 A is a standard Business Premiere seat. 6 J None No Power Seat 6 J is a standard Business Premiere seat. 6 K None No Power Seat 6 K is a standard Business Premiere seat. 61 A None No Power Seat 61 A is a standard Economy Class seat that is missing a window. 61 K None No Power Seat 61 K is a standard Economy Class seat that is missing a window. 63 A None No Power Seat 63 A is an Economy Class seat in the last row of the plane. The close proximity to the lavatories and galley behind may be bothersome. 63 B None No Power Seat 63 B is an Economy Class seat in the last row of the plane. The close proximity to the lavatories and galley behind may be bothersome. 63 C None No Power Seat 63 C is an Economy Class seat in the last row of the plane. The close proximity to the lavatories and galley behind may be bothersome. 63 H None No Power Seat 63 H is an Economy Class seat in the last row of the plane. The close proximity to the lavatories and galley behind may be bothersome. 63 J None No Power Seat 63 J is an Economy Class seat in the last row of the plane. The close proximity to the lavatories and galley behind may be bothersome. 63 K None No Power Seat 63 K is an Economy Class seat in the last row of the plane. The close proximity to the lavatories and galley behind may be bothersome. 64 D None No Power Seat 64 D is an Economy Class seat where the seat location directly between two lavatories at the rear of the plane may be bothersome. 64 E None No Power Seat 64 E is an Economy Class seat where the seat location directly between two lavatories at the rear of the plane may be bothersome. 64 F None No Power Seat 64 F is an Economy Class seat where the seat location directly between two lavatories at the rear of the plane may be bothersome. 65 D None No Power Seat 65 D is an Economy Class seat in the last row of the plane. The close proximity to the lavatories and galley behind may be bothersome. 65 E None No Power Seat 65 E is an Economy Class seat in the last row of the plane. The close proximity to the lavatories and galley behind may be bothersome. 65 F None No Power Seat 65 F is an Economy Class seat in the last row of the plane. The close proximity to the lavatories and galley behind may be bothersome. Each seat features a personal touch screen monitor with Business and Premium Economy featuring 11" monitors, and Economy Class featuring 9" monitors. Business and Premium Economy seats are equipped with Premium Head Phones at each seat. There is an AC power port for each individual seat in Business and Premium Economy. Economy Class has two AC powerports for every three seats. USB ports are available at every seat in all classes. On long-haul flights, Business and Economy passengers receive extensive meal choices and complimentary beverage service. Air New Zealand operates the Boeing 787-9 Dreamliner in a 3-class configuration on routes from Auckland to Perth, Shanghai and Tokyo. Business Class features flat-bed seating equipped with memory foam mattresses, a duvet, and two pillows. 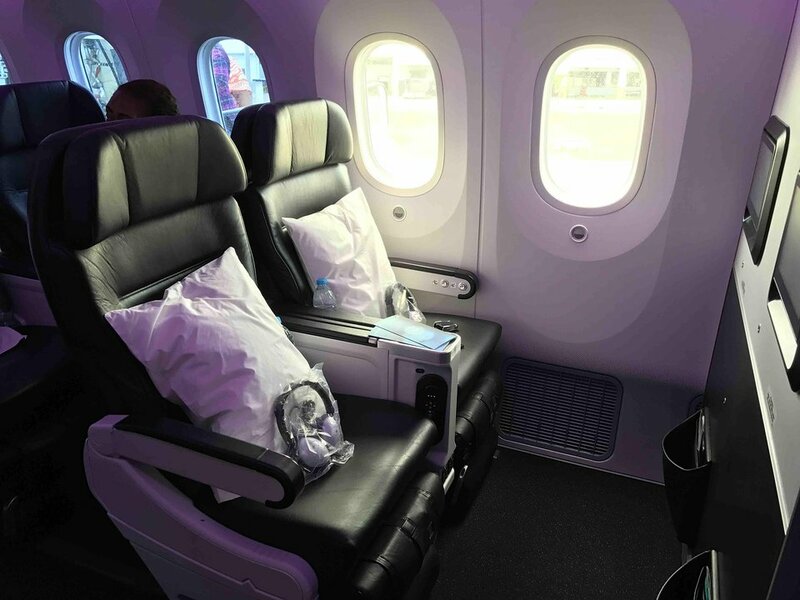 The Premium Economy on the 787-9 is not the ANZ Premium Economy "Spaceseat" product, but instead is manufactured by US Seat Designer, Zodiac, and is referred to as a "Business-lite" seat. These seats have 9" recline and a 5" wide armrest. In addition passengers in Premium Economy will have an integrated leg rest with extendable foot support and an adjustable winged head rest. Economy Class is configured in a 9 abreast, 3-3-3, configuration with 263 slimline Economy Class seats with a flexible head rest. best Business class seat across the entire fleet. But still not good enough for 5k a piece. Can't wait for the new Business class seat coming at the end of this year. Agree with other reviews--odd to sit at an angle. I found "bed" narrow and hard, even with thin "mattress". Service often too effusive, and meals not deluxe (a burger?). But really glad for non-stop to Chicago! great seat spacious wide and comfy. quiet cabin too, excellent service and good food presented on real crockery and cutlery, with a wide choice on the menu, copious amounts of drinks wine spirts beer etc, in real glasses, very friendly airteam, good bye econoomy. That Crew often open upper storage to take out additional headphones is bothersome. Flight taken June 1st 2018. I noticed that all of the other economy seats had a foot rest than came out so when you reclined your legs were lifted off the ground for more comfort. This wasn't available on row 38 in the middle. I would therefore say this seat is inferior to others. SIN to AKL Emergency exit on 787. Legroom lovely. But seat armrest against plane wall so almost impossible to sit properly if you have a passenger next to you. Worst seat ever. I fly solo between AKL and HNL 6 times a year for business on the Dreamliner 787. I highly encourage solo flyers to pay the extra for the Sky Couch option. I find it superior to Business for a fraction of the cost. Who cares about the food, I wanna sleep and at 6'2" I can comfortably curl and zzzzz. Fantastic airline with great service. Premium seats gave a true premium experience, with fantastic legroom for a 6'3" frame, even when compared to any other premium seats that I have experienced. 10/10 AirNZ. Proximity to the restroom wasn't as troublesome as I thought since they draw the curtains which separate business class and galley. Small numbers in business class share two restrooms with business class crew means less traffic between seat and galley. Seats are faced at an angle. As someone that likes to look outside during takeoff, it means turning my head a full 90 degrees to look outside. If you prefer not to see your neighbor in J (or vice versa), I'd recommend booking seats in A. Seat 61K doesn't have windows. The bean counters have struck again. Squeeze in extra seats and never mind passenger comfort. The strange seat layout was most disappointing after reading the sales pitch. I am going to Tokyo next time and Air NZ is the only one offering a non-stop flight. Oh woe, what am I to do? 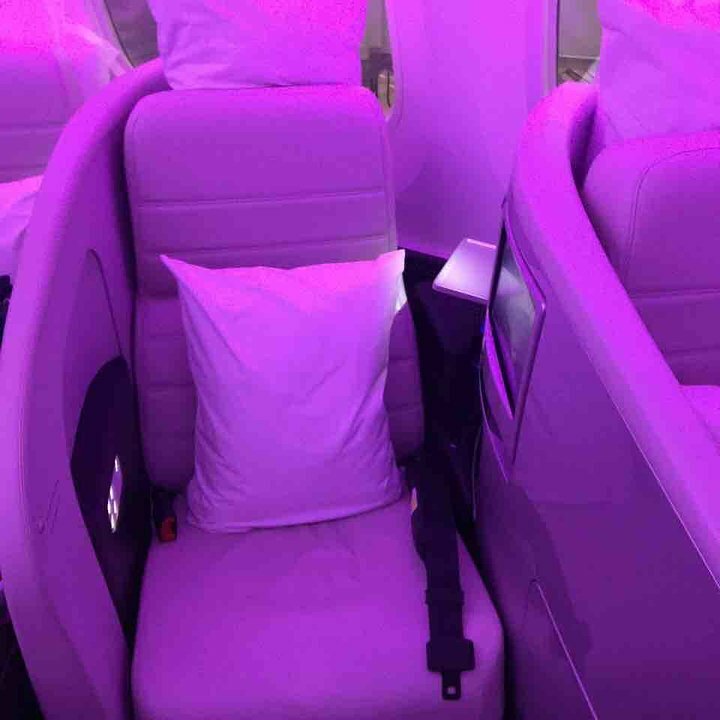 After changing from Virgin Atlantic LHR to Shanghai in comfort in Y class, to Air NZ on thier new 787-9 Dreamliner again in Y class my comments would be - be up front and advertise these seats for slim people only. They are absolutely deplorable for long haul flights - eg 10.5 hrs. To small, to uncomfortable and and impossible to eat a meal from. Does anybody actual try these seats out before offering them to the public? Try 3 adults together with a meal tray and try it! Pity Air NZ doesn't care about Economy Clients enough.Next time NZ to UK I'll use another airline. This seat was so much better than 37F given the uninterrupted legroom available. Pity the economy seats on this 787 do not have legrests (unless in SkyCouch rows) as it would have been even better. Note that there is a hard division between 35H and seats J and K so you cannot lift the armrests to sleep across the row. Premium Economy Perth-Auckland. Definitely worth the extra $$ for a mid-haul flight (5hrs). Comfortable seat, great accessories, excellent service and food. I struggle to sleep in economy but find it much easier in PE with the extra room and seat recline. Always tricky getting in and out of a window seat for toilet if your seat mate isn't known to you and is sleeping, PE does nothing to mitigate this...worth it if you can afford it. I flew from Auckland to Perth. The seating arrangement on the right hand side is awful with all the passengers looking at each other. The seat size is very small. Service was just OK and the food was not too good. If we fly direct between Auckland and Peth again it will be in premium economy. Don't bother with Qantas as they run 737s. I recently flew on this aircraft type on the Auckland - Singapore sector. My seat number was 36A. I must say I do have mix reactions flying on this aircraft type (and Air New Zealand in general). I have heard that 3-3-3 on a 787 Dreamliner is very cramped and uncomfortable, and that is true to a certain extent. 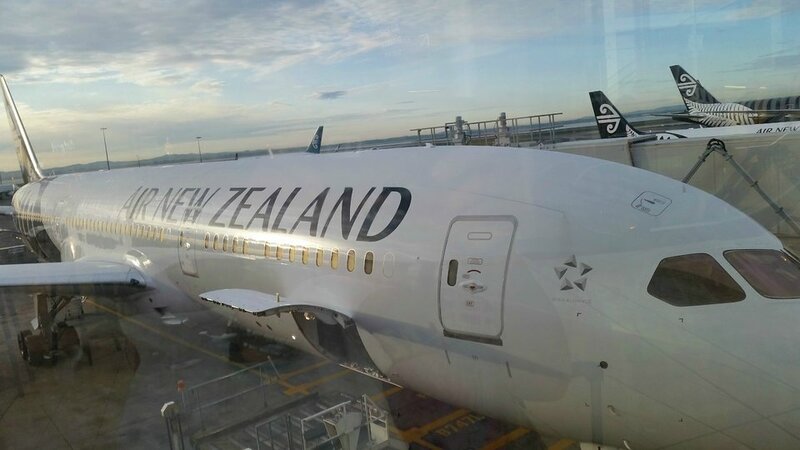 This is only my 2nd time on a 787,and the 1st time on Air New Zealand's 787. The 1st time was about 2 years ago on Jetstar's 787, but that time we had 3 seats between the 2 of us, with the flight being pretty emppty so we didn't feel the "squeeze". This NZ flight was full to the brim, literally every seat taken, so we felt the lack of shoulder room - we don't have broad shoulders and even then we can feel it. Thank goodness Air NZ's seat itself was pretty comfortable and had good recline and support, which allowed me a good 5-6 hours sleep on the flight. The pitch/knee room was also pretty good, so that somewhat makes up for the seat width. I can't imagine if you had to sit next to a person with broad shoulders. Having said that, Air New Zealand's service was good, and with the 787's higher cabin humidity, it somewhat makes the flight a little more bearable. Overall I would rate my experience a 7 out of 10 - having a wider seat would certainly bump up the scores. Our flight was Auckland to Honolulu, 8 1/2 hours on a night flight. Seats were very narrow & firm, with little leg room. The air circulation system was making the strangest wheezing noise like someone with a bad head cold. On the return flight we changed our seat choice to row 50 A & B, exit row. This gave us very good leg room but the seats were still very narrow & we are by no means large people. I would never choose to fly on this aircaft again & if it was the only option , I would choose another airline with better seating. I recently (yesterday) returned from Singapore on this plane. I sat in economy seat 54K. After reading many of the reviews of the economy seats on this plane i was nervous about how 10hrs in one of these small hard seats would be. Well its not actually that bad. Its not the best economy seat ive ever been in but its far from the worst. The crew were good, the food was OK but the big difference is the cabin pressure in the 787. It really makes a noticeable difference to how quickly you get dehydrated, because you don't. The inflight entertainment system is very good to which helps on long haul flights. Overall id give this seat, plane and service a 7 out of 10, and its hard to get much higher than a 7 in economy class. The Business Class arrangement is very odd. The seats are on such an angle that it is virtually impossible to look out the windows. They are so narrow and close to the next seat that you can hardly feel comfortable. Service and food were fine, but you feel like you are watching everyone go up and down the aisles. 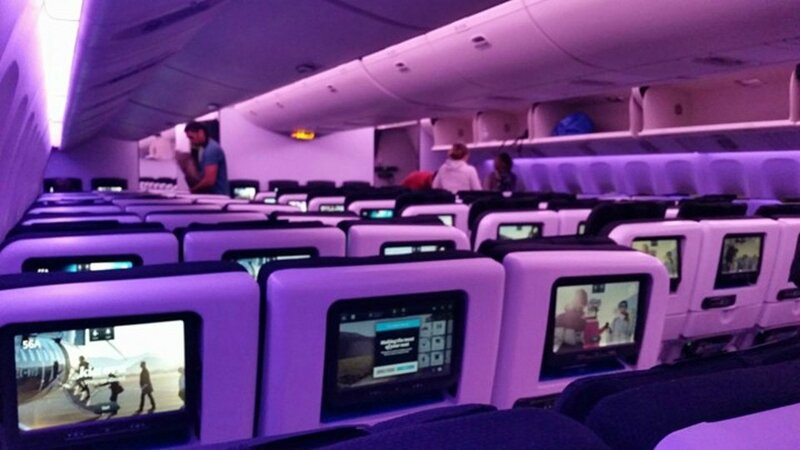 Would think twice before booking a Business Class seat on a Air NZ 787 again! Totally bizarre business class layout, when you walk along the aisle it feels like youre walking into a meeting room everyone is so close together and facing each other. Its really not very nice. The seats themselves are really narrow so its hard to work or stow things. The worse thing though is you get no privacy because the dividers are so low you can look right over the shoulder of the person next to you. Just by simply turning your head you can literally see every single passenger in the cabin. The guy next to me could read everything I was writing on my laptop which is not acceptable in BC long haul. For a new plane Im surprised this is where Air NZ got to, felt more like a short haul option. These economy seats are the worst I have experienced. Airlines keep claiming better effiency aircraft, what they don't tell you is it is at the passenger comfort. Really do they have no compassion in selling these seats for long haul flights? Criminal. I booked seat 23F to give me leg room and no one in front but was asked to swap as a couple had been split up. I said yes then found I was getting seat 25E! Middle row. I must admit that I was pleasantly surprised at the huge amount of leg room (more than the bulkhead seat) and the space around me. It was a good seat and I won't hesitate to book this again. Extremely narrow seats, very little room to put feet, footrests almost impossible to operate. One of the noisiest flights I have been on.. Staff disinterested, service poor.When compared with A380 and B777 economy seats.. really no comparison.. Will never fly one of these horrors again. Both myself and partner were seated in the middle aisle with a middle seat and an aisle seat. We both agreed that the seats wre too narow and with very narrow armrests as well and neither of us are overweight people. The recline was ok but the seats themselves are under padded and very hard . We were on the Perth/Aucland run and within 45 mins boths of our rumps were suffering badly. We both also found the cabin to be too hot (could this be due to the full cabin air con and higher humidy that is part and parcel of this aircraft) and although i have read about people complaing about the electrically dimming windows this did not bother us as we were in the cenre seating. The service and food was satisfactory but because of the extremely uncomfortable seats I will definitely not fly this aircraft again unless in an emergency. The seating is very poor. We flew 6 hours WA to NZ non stop...packed in 3 a breast shoulder OVER shoulder. Very crampt. You sit down and immediately realise the above. The overhead lockers, there's no hope to reach them if you're short like myself. Noisy. Food was the only thing that was good. Seats feel much smaller on this plane. Do not like the way I am angled and having to look at my neighbours. For a new fit out I would have thought they could have added a larger screen. Movie choices are as limited as ever. Food was good and service was adequate. I flew the 787 in seat 3K and prior to my flight with the 787, I flew in a 777 in seat 4K. The difference between the two was quite noticeable. The shoulder width is definitely tighter in the 787, both in the seated position and lying flat. You also sit further forward in the 787, so the drink tray that folds down on your side is behind you instead of beside you. There's a seat buckle on the ottoman right where you put your heel. I have no idea why it's there as it wasn't present in the 777, so very odd??? Lastly the seat belt itself has a lot of padding on it, which makes the seat feel even tighter and as mentioned there is a real lack of privacy. The side walls are very low and for those in the middle or on the right hand side, you find yourself being forced to look at others across from you. I don't understand why the window seats don't face the window and you enter from the rear of the seat??? I find the Air NZ service to be excellent, but this new business class seat is one I'll avoid where possible in the future. Best position! Nobody behind, which enables full recline. Closest to toilet and leaving the plane. Will plan on using these seats all the time! The most uncomfortable economy seat I have ever had the misfortune to endure. No lumbar support, hard seat cushion, narrow, hard armrests, and the headrest is a waste of time. Never again. A most uncomfortable ride due mainly to seat spacing .I would avoid using this aircraft again. The premium economy seats while wider than economy are difficult to get comfortable in. Travelled with wife and we both commented how challenging the seats were. The remote is the only way to easily manage the ES because it sits on the bulkhead wall. Touch screen is the way to go if you can. Very disappointed in 787, worst flight ever across Pacific. Electric windows a disaster, no sunshade, so unbearably hot. Terrible air conditioning on this plane. Poor seats, poor legroom. Plane vibrates/resonates! Entertainment system is OK. Inflight Air NZ service very poor - they've lost me as a customer. We travelled on the overnight flight to Honolulu and paid extra for the skycouch option in row 38. Never again it was a complete waste of money and most uncomfortable. Air NZ seem determined to turn themselves into the Easyjet of the Pacific. Very nice Premium economy seat. Not as great as the Space seat in the nz1 or nz2 flights, but the same wonderfull in-flight service. Which pays off less during a red-eye flight ofcourse. Enjoyed it a lot! Great value for money. Although the electrically dimmed windows are a nice touch, they only dim the visible light coming into the cabin, not the infra-red. This flight was a daytime westerly one, so the sun was on the starboard side of the aircraft for the entire trip, making the cabin temperature in the K seats almost intolerable, and the windows hot to the touch. When asked, the cabin crew said they had no means to decrease the cabin temperature and, with no mechanical shade to pull down, and no personal air vents, there was no way of making the flight any less uncomfortable. My advice... pick the shaded side of the aircraft. the narrowest busines class seats i ever had. notcomfortable, no space to sleep, legroom too thight (i am 1.87m) monitor is small... food is nice but in compare to Singapur airlines only less than half space. not compareable. Flying to Shanghai last year it seemed when the other toilet flushed perhaps next door the unit I was sitting on also flushed with associated wind whistling past the lower regions which was quite refreshing but somewhat of a surprise to the senses to say the least! Being a plumber by trade considered I may be able to charge a service call to have a look on how to fix.... Awesome plane to travel on! Flight from Auckland to Perth. Very good seat, private, comfortable and being 1.87m tall, was able to sleep completely flat. Most enjoyable flight. Had the 3 seats for the two of us, so used Skycouch. I liked having the foot rests(Hubby didn't) but they were hard to get up and down. Padding on seat was very thin and not very comfortable. TV screen from seat in front reflected in my window and was annoying and since they do not have pull down window shades I couldn't do anything about it. Have also sat in 42j and that seat is hard and uncomfortable also. Touch down. Arrived in Perth W.A from Auckland. Remained seated as instructed until the aircraft had come to a complete stop and the pilot had switched off the seat belt sign. By this time my left leg was wet, my jeans saturated in dripping air-conditioning water. I spread my legs apart to avoid the dripping water. Not a pleasant way to arrive. Not one to complain I shrugged it off. Fortunately I'm not made of sugar, I did not melt. the best premium economy seat i have experienced. the aircraft itself is very well designed and very comfortable. food was good and staff was friendly and attentive. all in all a very enjoyable flight. If you are flying solo on this plane in business class, definitely go for an A seat, as the A seats have their own aisle and fell a little bit more private. plenty of leg room but next to galley and toilets. No seat in front so tray table and entertainment in the armrests. Also nowhere to put anything (rubbish magazines etc). Toilet traffic only gets bad after meal and before landing. An absolutely wonderful flight. The 787-9 is *Quiet*, and the environment is AMAZING. you can get off that plane feeling like a million dollars. The increased humidity and air pressure are very noticeable. I flew Auckalnd Shanghai in Business class, and its simply awesome. There is nothing wrong with seat 1A, so, the Be aware comment is just a bit over the top. I was looking forward to this flight on the new Dreamliner but was disappointed. The plane looked immaculate, new and full of gadgets but that was it. The engine noise was loud throughout the flight and would recommend bringing noise cancelling headphones if you want to listen to the entertainment system. The window blinds are a nice touch but some were already not working well. Seat was uncomfortable and very narrow. I realise that you get what you pay for but this seemed more cramped than the 777 that I took recently. Overall left me unimpresssed. Seats were fine. The lay flat bed was good and I got a good night sleep. The screens for the TVs are very old and my iPad showed much better movies - a shame with the price of the seat. Very grumpy staff on both the flight up and back. There seems to be more pitch and the tray table appears shallower, which makes for a more spacious feel. This a very cool aircraft. 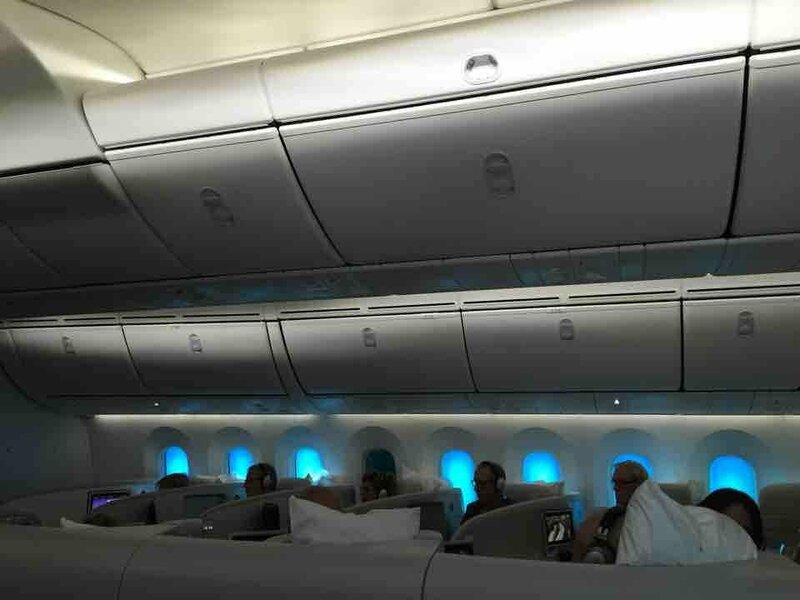 The pilot's rest area of the Boeing 789 is located in the ceiling and extends to the first three rows of the business class cabin.Meaning that passengers in seats 1J, 2J and 3J don't get their own overhead bins. Air New Zealand flies 2 versions of Boeing 787-9 (789).